Reviews of the Olympus TG-860 from around the web. Following an underwhelming tough compact named the TG-850, Olympus clearly had some kinks to work out. The TG-860 has inherited its predecessor's two best features—the 21mm wide angle and the 180° adjustable screen—but it's also received numerous upgrades: Wi-Fi, GPS, a second shutter release, a second tripod mount thread, a Sportcam mode and even new colours. Are these changes enough to make the old armchair adventurer into a genuine all-terrain machine, ready for the dust and extremity of the outside world? 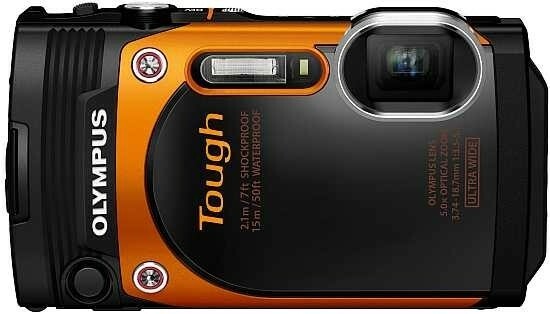 The Olympus TOUGH TG860 is a water-proof, shock-proof, freeze-proof and dust-proof compact. Launched in April 2015 it's an update to the year-old TG850 iHS. It retains the earlier model's 16 Megapixel CMOS sensor and the 21-105mm equivalent optical zoom, still the widest lens available on any waterproof compact. Also retained is the 3 inch 460k dot LCD screen which can flip forward for selfie shooting.